Many individuals face significant barriers when trying to start a career in farming and ranching, such as limited access to lands and markets, inflation of land prices, high costs, and a lack of support networks. The impact of these barriers can be seen on a national scale: from 2002 to 2012, the number of farm operators who were 75 years old and older grew by 20 percent, while the number of operators under 25 decreased 30 percent. Beginning farmers often struggle to afford the initial cost of buying land. One of the most significant barriers to entry, land prices are rising in much of Utah County. As a result, alternative land-acquisition and land-leasing programs are emerging as a crucial resource for farmers who are unable begin farming or ranching through traditional avenues. New farmers and ranchers often have difficulty receiving financial aid, especially if they do not have the assets needed to invest in a farm or an established and extensive track record in the industry. Farmers who want to farm using less traditional methods or utilize new farming technologies can find it even more challenging to secure loans and funding. Existing farmers also need resources to help support their businesses. Financial resources need to be expanded to assist farmers who are established assets in local agriculture. More resources are needed to meet the financial realities of farming in Utah and to properly incentivize farming. Many small-scale farmers find it difficult to make agricultural production a profitable business. Farming has traditionally been a risky enterprise because of inconsistent income and the constant risks of crop loss, price collapses, significant weather events, and external price fluctuations. Financial assistance helps farmers overcome these obstacles and continue farming. Utah County lawmakers, governmental organizations, and farming organizations should organize a summit to connect young farmers to older farmers. The summit would provide younger farmers with mentors and encourage older farmers to pass on knowledge about local farming to the next generation. This summit could also pair farmers with organizations that administer financial-assistance programs. Nonprofit and governmental organizations should examine available strategies and determine which resources fit well together, where gaps exist, and where additional outreach and education is needed to help connect farmers and ranchers to financial resources. It is recommended that farm organizations like the Utah Department of Agriculture and Food, the U.S. Department of Agriculture, and the Utah Farm Bureau coordinate together to streamline state and federal financial programs. Existing programs for farmers and ranchers should not require complicated applications or extended processes. Financial programs, grants, and loans often target practicing farmers, who often do not have the time for lengthy application processes. These organizations should make changes to ensure that existing programs are easily accessible to most farmers. It is recommended that state and county lawmakers establish additional land-acquisition and land-leasing programs to increase beginning farmers’ opportunities to access lands. Major private and public landowners in Utah County should consider leasing vacant land to beginning farmers to increase the county’s agricultural output and provide beginning farmers with valuable experience with small-scale agricultural production. Financial assistance for Utah farmers is primarily available at the federal level. The state and county should establish new financial programs to encourage farming in Utah County and to remove some of the challenges facing farmers in the region. As opposed to nationwide resources, local programs can be more tailored and targeted to the needs of farmers in Utah County. Utah County commissioners and the Utah State Legislature should consider expanding assistance programs for farmers in Utah Valley as well as the rest of the state. It is recommended that lawmakers and farm organizations work to create additional programs to fulfill identified needs and find ways to help existing farmers be more financially secure and profitable. New Mexico has hosted several farming and ranching summits that have successfully connected new agricultural producers with older farmers and spread knowledge of new and more efficient farming practices. The New Mexico Organic Farming Conference, for example, is a yearly farming summit that focuses on sharing experience and expertise through workshops and sessions. Utah State University Extension has hosted farm and ranching workshops, though they have not been held consistently and future summits would ideally be larger and involve more ranchers and farmers. In 2015, Salt Lake County launched Farmlink, a program focused on connecting interested urban farmers with vacant lands that could be used for food production. These lands are either privately owned or publically owned by entities such as Salt Lake County or a municipality. The program was incentivized through property tax reductions for landowners who were willing to lease their land for urban commercial farming. Establishing agriculture as an industry cluster in Utah would emphasize its importance to the state’s economy and better connect farmers to resources and other support. As a result, the agriculture industry will become more sustainable and economically feasible. The purpose of industry clusters is described by the Utah Governor’s Office of Economic Development as follows: “With the Utah Strategic Industry Clusters, Utah works to create sustainable advantages around emerging (and mature) sectors by combining and aligning a wide variety of business interests, including: industry experts, research universities, capital, fresh technology, and environmental concerns.” Agriculture is an important industry in Utah, and the economic impacts of agriculture are dramatic. According to a 2011 Utah State University study, the agricultural processing and production sectors together account for $17.5 billion in total economic output after adjusting for multiplier effects. The two agriculture sectors account for about 78,000 jobs and 14.1 percent of total state output. Having a cluster would show the state’s economic and legislative leaders that the state considers agriculture to be a viable, lucrative, and important business sector in Utah. Agricultural experts from universities, state agricultural organizations, the farming industry, and advocacy organizations need to educate elected officials and governments on the importance of agriculture to the state's economy because clusters are established based on what these decision makers see as core strengths of the state’s economy. It is recommended that existing state-level organizations like the Utah Natural Resources Conservation Service and Farm Service Agency offices, the Utah Department of Agriculture and Food, and the Governor’s Office of Economic Development promote agriculture as a state industry cluster. State universities should also teach Utahns about the importance of agriculture to the state’s economy. Investigate: Analyze local and national trends, perform outreach to verify data, and select clusters that have the most potential for growth. Inventory: Define the cluster specifically and inventory organizations and institutions important to the cluster, key leaders in the industry, and policies and practices that affect the cluster. Convene: Review and confirm the cluster’s focus and scope; identify the needs, opportunities, and obstacles the cluster faces; and identify areas of strong mutual interest among stakeholders. Diagnose: Synthesize findings into a market analysis, select strategic interventions, and develop an action plan with stakeholders. Act: Establish clear expectations for cluster partners, allow leadership to emerge, and implement the identified interventions. Evaluate: Analyze how well the interventions achieved their goals, including how well the interventions created job growth in the cluster, and explore possibilities for additional interventions and strategies. One of Oregon’s core business clusters is agriculture. Oregon estimates agriculture provides 1 of every 8 jobs in the state and makes up 15% of the state’s economy. The establishment of agriculture as an industry cluster has allowed Oregon to research agriculture’s economic weaknesses and strengths and create initiatives to protect and encourage the state’s agricultural businesses in the future. Urban agriculture refers to the growing, processing, and distributing of food and other products in urban rather than rural areas. Urban agriculture connects residents in cities to food-growing processes that would normally be inaccessible to them. Urban agriculture positively affects communities, providing both a source of local and healthy food and a place for people to come together and strengthen community ties and relationships. Urban agriculture includes green-roof gardens, community gardens, and other commercial and noncommercial food production efforts in urban areas. Urban agriculture is valuable because it allows city residents to become involved in and learn more about the food production process. Local gardens provide educational opportunities for residents of all ages, and the benefits of exposing elementary school students, for instance, to urban agriculture are particularly popular and well documented. Utah County is already home to several existing pockets of urban agriculture that could connect the urban community to the agricultural sector socially and economically. Traditional agriculture could also be affected as urban residents become more aware of the experiences and benefits of agricultural production. Accessory uses on small parcels of land are another option for agriculture in primarily residential areas. Being able to produce food for personal use or commercial sale can expand agriculture on these parcels, often considered “lost” from an agricultural standpoint. Streamlining accessory-use processes and educating residents interested in small-scale agriculture can expand the prevalence of agriculture in Utah County and promote a broader appreciation for larger agricultural efforts. Urban agriculture further benefits cities by acting as green infrastructure, reducing storm water runoff, increasing greenspace, reducing the urban heat island effect, and converting vacant lots into lively spaces for food production. Urban agriculture is also particularly beneficial to low-income and otherwise disadvantaged families because it provides low-cost food products and encourages people to better integrate with their local communities. It is recommended that city councils enact ordinances and work with the state legislature to provide tax breaks and other incentives for urban farming, particularly the establishment of community gardens. Community gardening organizations should partner with local governments to pilot different forms of urban agriculture. One of the most popular and widely implemented examples of this is temporary urban gardening, where gardens are planted in underused, vacant lots. Through temporary urban gardening communities can combat blight and test the viability of more permanent urban agriculture. If temporary urban gardens are successful, more permanent urban agriculture should be established. Cities can also work with their communities to bypass the temporary-garden stage and instead immediately implement more permanent community gardens and other forms of urban agriculture. Individuals can adopt accessory agricultural uses on their property, which demonstrates their interest in agriculture on all scales while also increasing the supply of local food in their communities. In 2015, Salt Lake County launched Farmlink, a program focused on connecting interested urban farmers with vacant lands that could be used for food production. The program was incentivized through property tax reductions for landowners who were willing to lease their land for urban commercial farming. Wasatch Community Gardens is the state’s largest community gardening organization, providing educational and financial resources to help neighborhoods, schools, and families begin community gardens. The organization runs near-weekly classes during the planting and growing seasons. Utah law allows for conditional agriculture on residential land. Currently, the local planning commission must approve the production of any value-added agricultural products grown as a conditional use on a case-by-case basis. In 2013, Urban Agriculture Incentive Zones began to be established in California. These zones create tax incentives to encourage both commercial and noncommercial agriculture on lots between 0.1 and 3 acres in urbanized areas across the state. Technological innovation can increase the overall efficiency and economic feasibility of the agricultural industry. Research and development of agricultural technology need to be incentivized to help revitalize the farming industry. Modern farms work much differently than those from just a few decades ago, primarily because of advancements in technology. Today’s farms routinely use sophisticated technologies such as temperature and moisture sensors, aerial images, and GPS technology. Further improving agricultural technology will help increase crop productivity, reduce negative environmental impacts, increase worker safety, and decrease water, fertilizer, and pesticide use. Vertical farming is the practice of farming food in vertically stacked layers, using technology to control all environmental factors. This agricultural technology helps increase crop production, conserve resources, and expand the availability of local food, especially in urban built-out areas. Drip irrigation is a form of irrigation that saves water and fertilizer through a controlled delivery of water through a network of tubes or pipes to the roots of plants. This technology improves plant growth while allowing farms to use less water. Aquaponics is a system of aquaculture in which the waste produced by farmed fish or other aquatic animals supplies nutrients for plants grown hydroponically, which are then used to purify water. Aquaponics uses less water than traditional farming, does not necessarily require soil, and improves yields compared to traditional farming methods. Tax credits and other funding options are available at the state and federal level for businesses exploring green business practices and technologies, but agriculture-specific funding is far less common. State or county-specific tax credits or funding options should be used to help Utah farmers and businesses explore new technologies that could benefit agriculture across the state. It is recommended that state and federal agriculture organizations provide loan programs to incentivize farmers in pursuing new technologies to improve their businesses. County lawmakers and farm organizations need to identify gaps in federal and state programs, and should establish more specific programs to incentivize the development and exploration of new farming and ranching technologies. Utah State University and other universities should continue to promote agricultural technology businesses through agricultural technology programs and related research. University classes in agricultural technology should connect farmers in the field with students to give students real-world experiences while improving farm businesses. Governmental and private farm organizations need to help farmers stay up to date on current technologies and explore the viability of implementing technological updates to their processes and operations. Houweling’s Tomatoes is a sustainable greenhouse farm in Mona, Utah, that uses excess heat and C02 from an adjacent natural gas power plant to grow tomato plants. This heat that would otherwise be wasted is instead used to keep the greenhouse warm through the colder months, which allows the farm to grow tomatoes all year round. Utah State University offers an Agricultural Systems Technology degree program, which combines studies in agricultural and biological sciences with courses in technical and business management skills. The program provides valuable assistance and a solid foundation to aspiring farmers and researchers as they pursue new agricultural technologies and careers in agriculture. The USDA’s Natural Resources Conservation Service administers Conservation Innovation Grants for the development of new conservation technologies and practices. Though mainly for governments and individuals, the grant is open to any person or business who establishes that their project benefits food safety, soil health, wildlife, and/or the economics of farming. Agricultural commissions are standing committees, created by individual cities, that strive to increase the visibility of agriculture in communities. They represent and advocate for the farming community, encouraging the pursuit of agriculture, promoting economic opportunities for farmers and ranchers, and preserving their community’s agricultural businesses and lands. Agricultural commissions are primarily focused on connecting local farmers and ranchers to resources that help agriculture flourish in each individual community. Utah County farmers should continually take advantage of the increased networking, educational, and economic opportunities provided by agricultural commissions. These commissions allow farmers to be more involved in the decisions of local government, increasing communication between farmers, politicians, and city leaders. 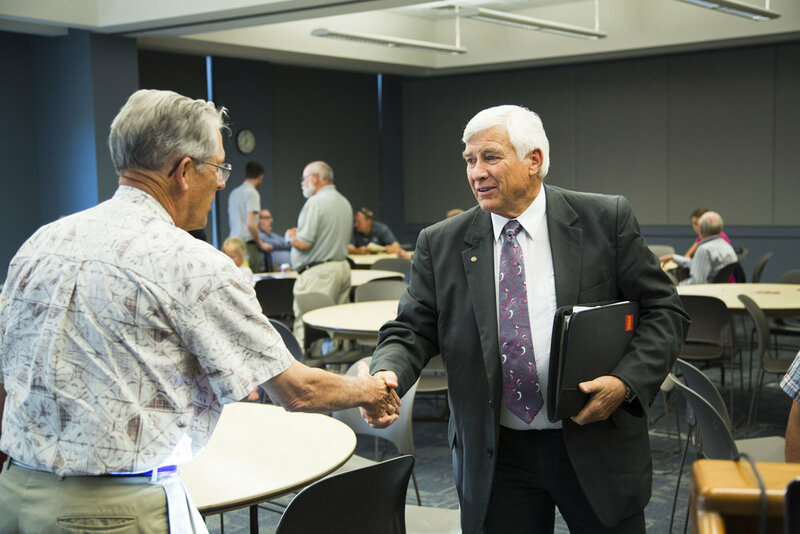 Improving the often-lacking dialogue between farmers and local leaders is important in identifying and resolving challenges and will ultimately strengthen the agricultural industry in Utah. Identify leaders and organizers to explore the possibility of an agricultural commission in the area. Assess interest for an agricultural commission in the community. Talk to farmers, residents, boards and committees, and community decision makers. Gather the support of farmers and town leadership. Organize a public informational meeting. Invite farmers, residents, and the public through written letters of invitation, press releases, and newspapers articles. If possible, request that members of established agricultural commissions speak about why they organized, what they do, and the benefits to agriculture. Answer the questions: Is an agricultural commission important for our town? Do you think we should organize an agricultural commission in town? Gain commitment from participants to serve on an agricultural commission steering committee. Publicize newly established steering committee meetings. Draft an agricultural commission by-law and town meeting warrant article with input from town boards and town counsel. Present articles at a town meeting for discussion and vote. This presentation is provided by well informed and prepared advocates. More information can be found in the Massachusetts Association of Agricultural Commissions’ Toolkit for Organizing a Town Agricultural Commission. In several of its cities, Massachusetts has agricultural commissions that focus on the unique agricultural issues facing each town and community. The Massachusetts Association of Agricultural Commissions supports agricultural commissions by coordinating the commissions’ resources and relations with state and federal agencies, private and nonprofit organizations, and elected officials. Existing agricultural commissions tackle a range of issues ranging from marketing coordination to local disputes, and their budgets range from $0–$1,000 per year. The Utah Association of Conservation Districts fills a somewhat similar role, establishing separate districts across Utah and incentivize landowners to protect soil, water, and other natural resources. However, conservations districts do not focus specifically on agriculture.